Commander Andrew Hough (pronounced ‘Howe’) joined the Royal Australian Navy in 1995, through the Australian Defence Force Academy. Commencing professional training in 1998, he proceeded to a range of postings as a junior Maritime Warfare Officer from 1999-2004, including patrol boat service, an exchange posting with the Royal Canadian Navy, and qualifying as a Fighter Controller. Hough served in Adelaide Class Frigates, deploying to the Middle East on two occasions, including service in the Iraq War 2003, and subsequently served as a Fighter Control Instructor with the Air Force. Lieutenant Hough qualified as a Principal Warfare Officer in 2005, and further specialised as an Air Warfare Officer. He served in Anzac Class Frigates, on exchange with the Royal Navy on promotion to Lieutenant Commander, and returned to Australia as the Fleet Direction Officer. Highlights of this period were a third operational deployment to the Middle East, exercises in Hawaii and South East Asia, a deployment to the Caribbean for counter-narcotics and hurricane relief operations and a year training ships in Air Warfare. Lieutenant Commander Hough was then selected as Executive Officer of the frigate HMAS Melbourne in 2012, and deployed on two further occasions to the Middle East, with Melbourne enjoying considerable success in counter-piracy and counter-narcotics operations. Hough then proceeded on long service leave and spent the break enjoying an extensive motorcycle tour of the United States with his wife. 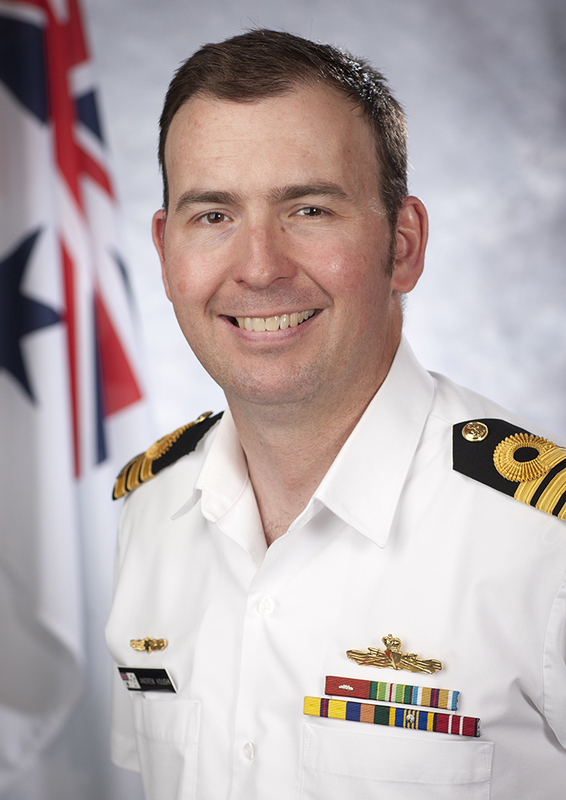 Following the Australian Command and Staff Course in Canberra in 2015, Hough served at the strategic level of Navy as the Personal Staff Officer to the Deputy Chief of Navy, and then in Navy Workforce Management. Commander Hough holds a Master of Arts in Military History from UNSW and a Masters of Military and Defence Studies (Art of War) from ANU. He was awarded a Commendation for Distinguished Service on the Australia Day Honours List 2015 for his performance as Executive Officer HMAS Melbourne. His professional awards include the RSL Sword for Dux of Junior Warfare Officer training in 1999, Dux of his Fighter Controller course in 2001, the Sydney-Emden Prize and Sword of Excellence for Dux of PWO training in 2005, the St Barbara Association prize for Dux of PWO (A) training in 2007, the BAE Systems prize for Dux of Royal Navy Air Warfare Training in 2009, and the Chief of Navy Prize for top Navy student on Staff Course in 2015. Commander Hough assumed command of the RAN Recruit School in January 2018.